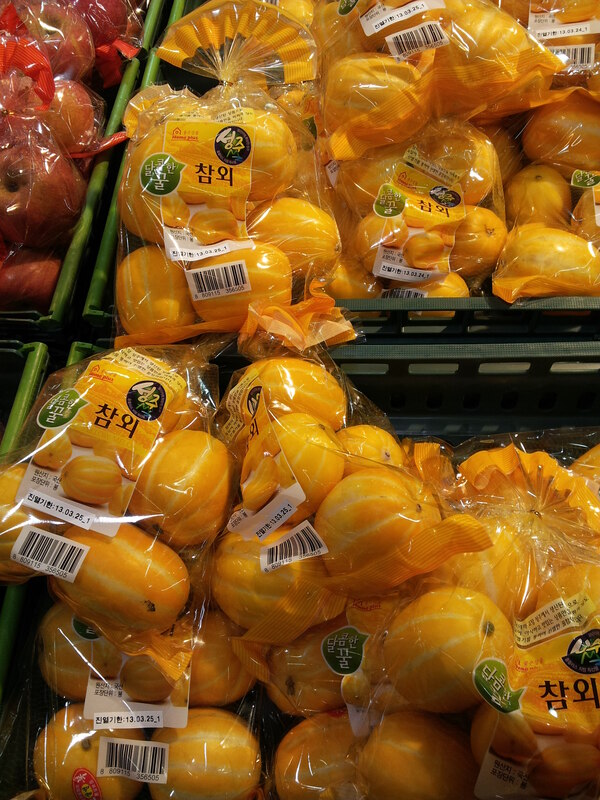 Yellow Melons; Although they’re called Yellow Melons in English, I had never seen them a day in my life before coming to Korea. They’re super popular in summer and surprisingly enough, they are also quite delicious. Boiled Lotus Root Slices; Here’s one I just learned last night. Honestly, I’ve been eating these things at school for ages and never knew what they were. Until last night of course. Thankfully, my English is pretty good so I simply read the name. What do they taste like? I wouldn’t know. Although I eat them, they look kind of dangerous so I mix them in with rice and other food stuffs. Are they healthy? Well they haven’t made me a Ninja yet so they can’t be that great. Ho duk; I really don’t know what to call these in English. 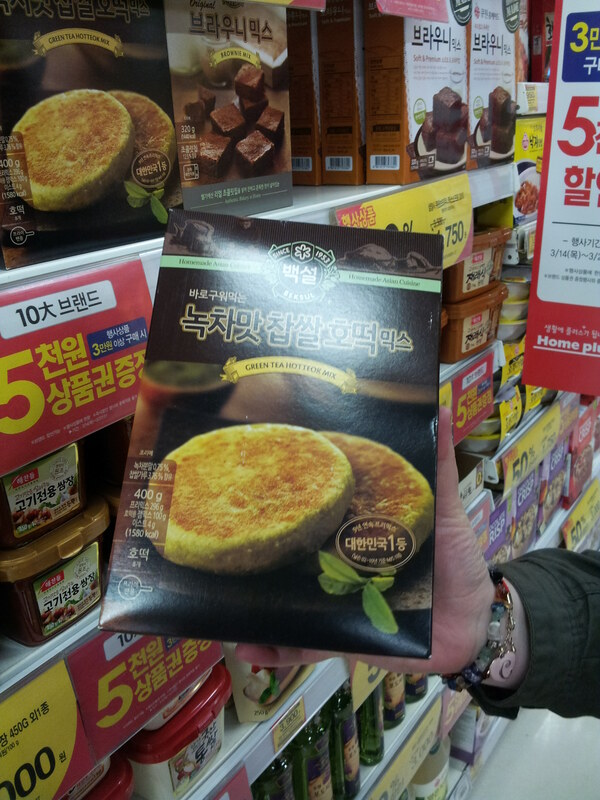 I think it’s sweet pancakes (although a Korean can correct me if that’s not accurate). They are super delicious. Pancake mix with cinnamon in the middle. Great in the cold weather and if you buy them from a stand they are only 1,000won or less. They also come with Green Tea mix as well as the regular mix. And you don’t need an oven to make them, only a frying pan. Win win. 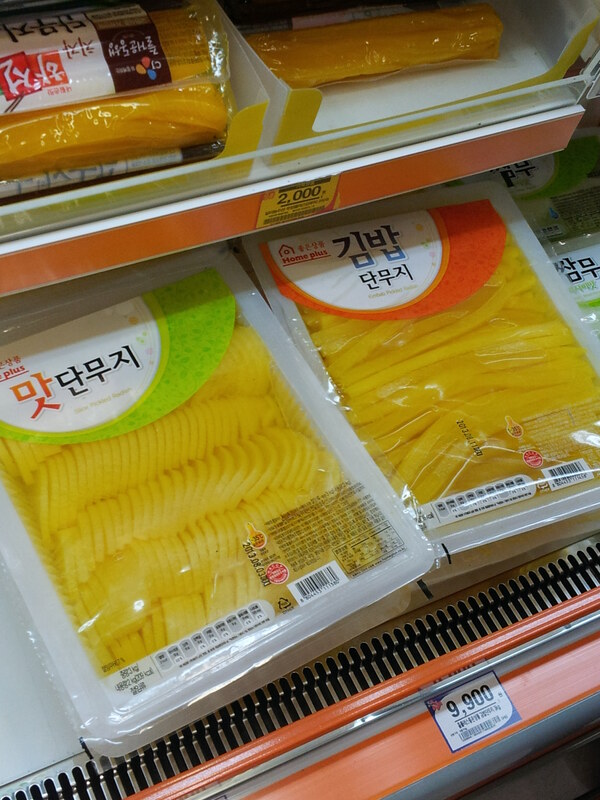 This packet was on sale also so for less than 2,000won I’m going to have some delicious Ho Duk. Kimbap component; This is the radish that goes into Kimbap. 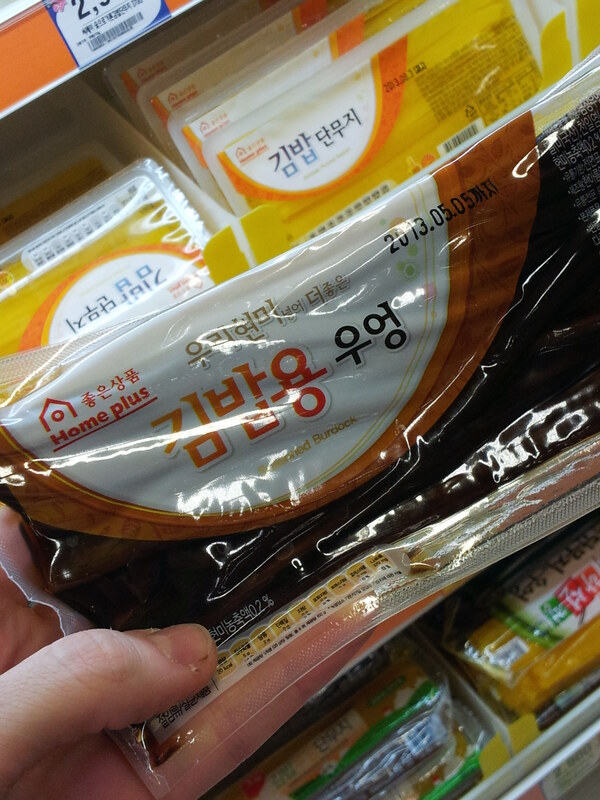 If you’re making a million kimbap, buy a packet of these and your sorted. Some people are actually brave enough to eat this by itself but personally I prefer mine mixed with all the other stuff in Kimbap. Another Kimbap component; I could have called it Seasoned Burdock but chose not to because I didn’t know what it was called until I took the picture. Again, it goes in Kimbap. I’ve never seen it eaten on its own (or maybe I have but didn’t connect the dots). Dairy Items; Just to prove that things here are super normal, I took a picture of the dairy section. 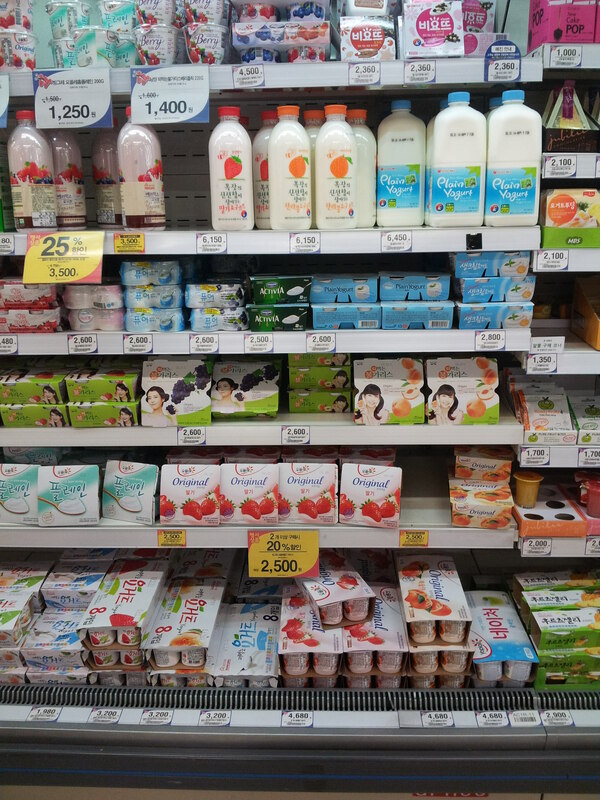 You can find yoghurt and all kinds of drinks and the like. 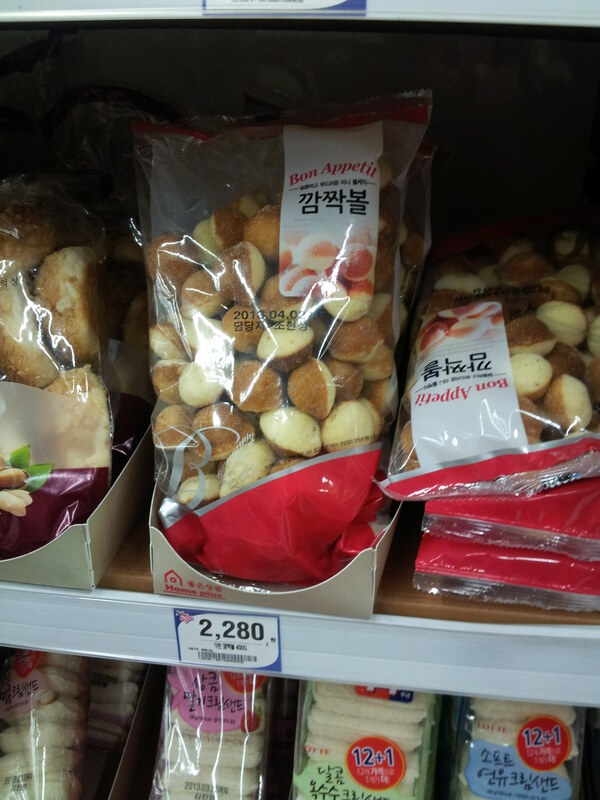 Snack Foods; The first one is like a Honey Pancake. Unlike the one before, you buy these ones already made and it’s not cinnamon on the inside. The picture on the right are sugary balls of flour mix. It’s really hard to describe. 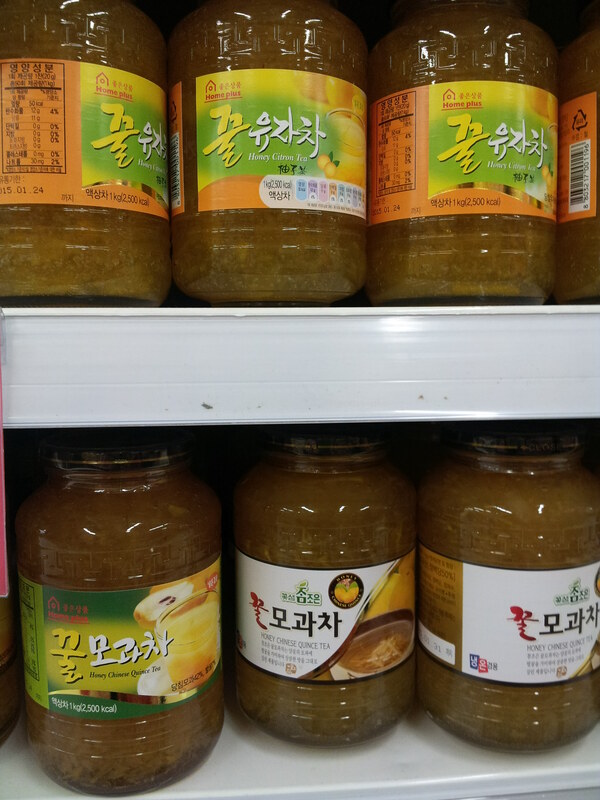 Tea; The top one is Honey Citron Tea which is like Marmalade but you add water and drink it. The bottom one is Honey Chinese Quince Tea. Quince is a type of pear, same deal here, add water and drink it. I’m sure its good for Vitamin C and all but there’s a lot of sugar in it so don’t go mad drinking it. The fish; This was definitely the highlight of the trip. 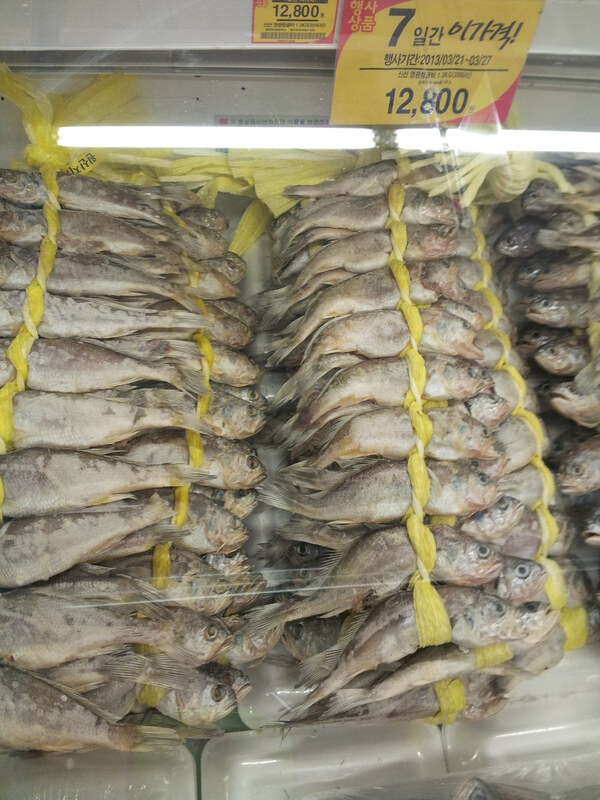 We were walking around the frozen foods and stumbled across these fish tied together. Many questions came to mind, 1. Why? 2. How would you get this home if you didn’t have a car? 3. How would you go about cooking this? 4. Who buys this? 5. Why? 6. Where would you keep this when you get home? We must have looked like we were in distress because the very friendly lady came over and we asked how you would cook/eat this. She gave us this look, as if we were stupid and said “oh you just cook it”. Excellent, thanks, that really clears it up for us. Any Korean reading this might be able to answer the question. Octopus and Squid; This is exactly what it says on the tin. 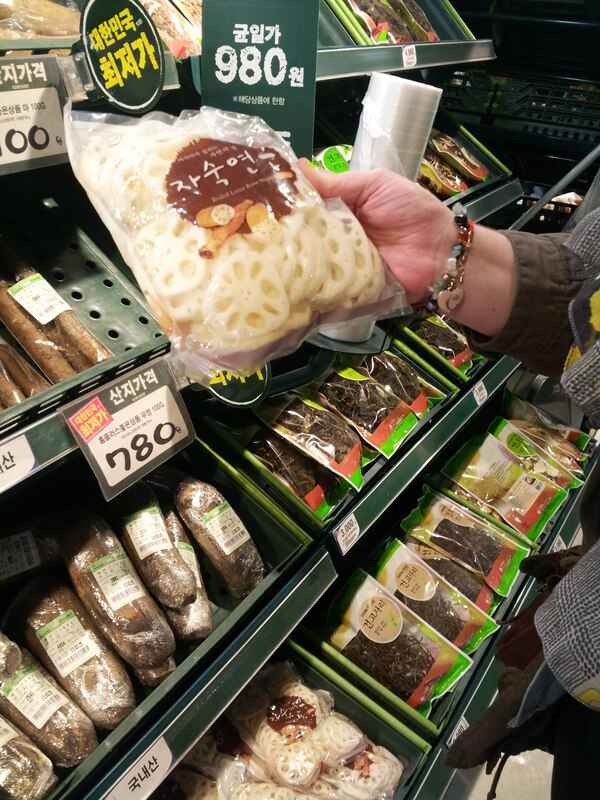 Octopus and squid, in a regular packet and in a form where you don’t need directions on how to cook it. Mandu; Mandu are dumplings in English. 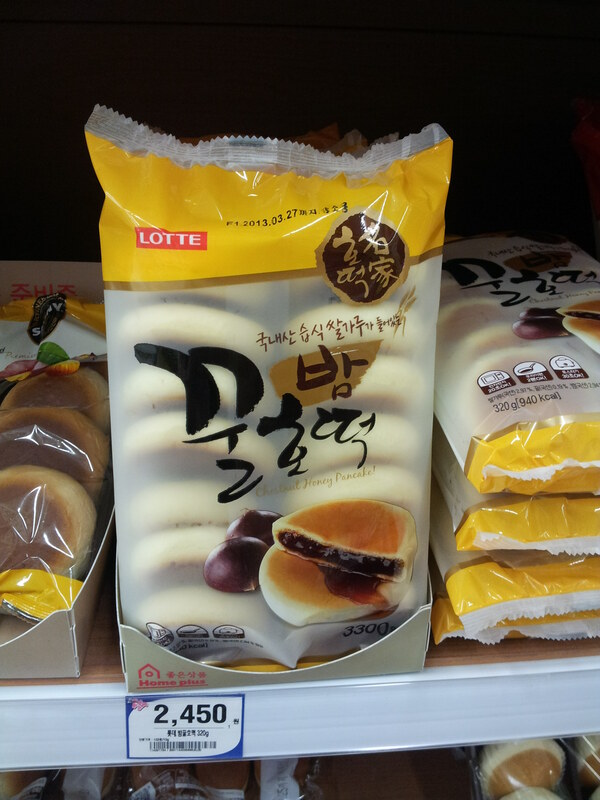 Possibly one of my favourite foods in Korea. And you can cook and eat them in loads of different ways. You can boil them, fry them or eat them in a soup. 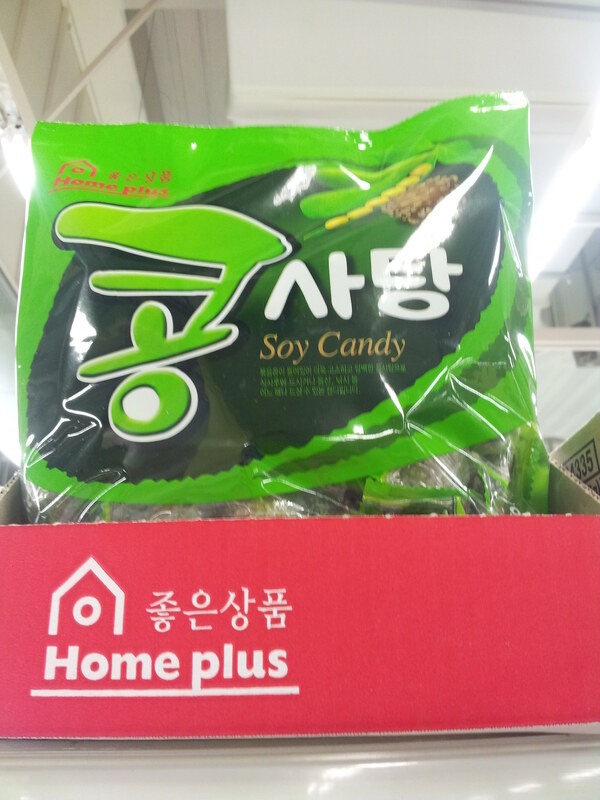 They come in pork flavour and Kimchi flavour. Super handy and super easy to cook. If you’re looking for toothpaste, look no further. 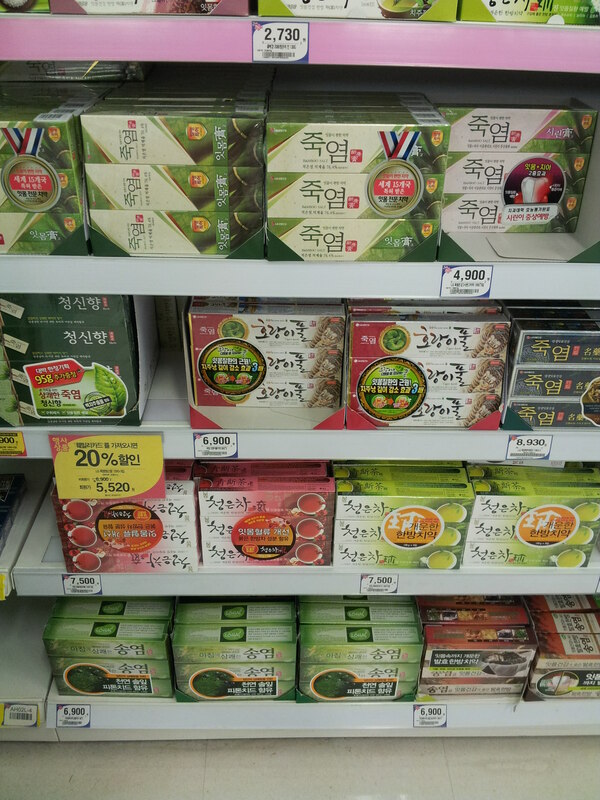 You can find Bamboo Salt, Tiger Herb, Forest fresh and all kinds of other equally attractive toothpaste flavours. We finally made it to the sweet aisle. 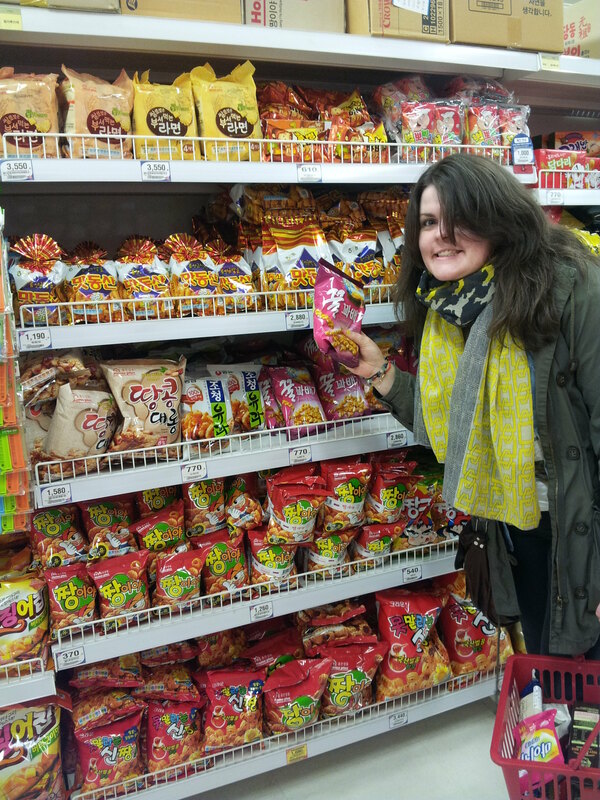 As Clare pointed out, they really love My Chews in Korea (picture on the left). 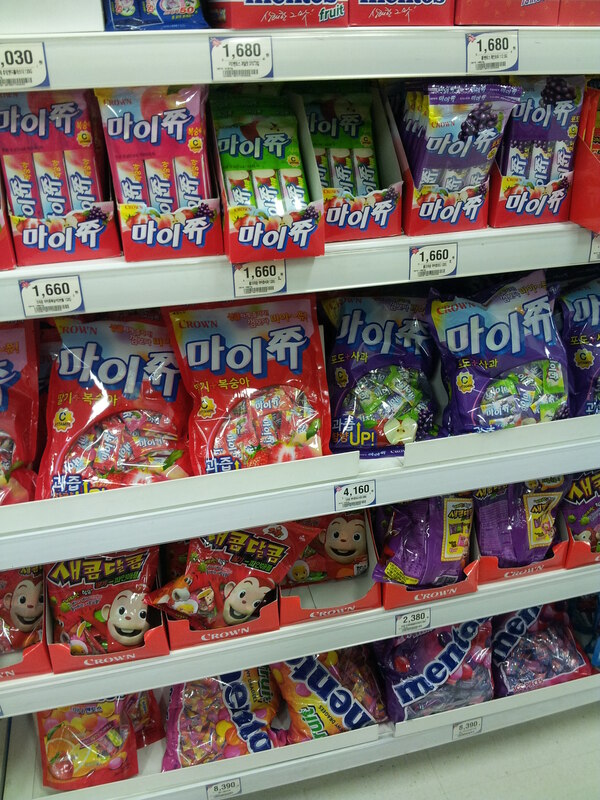 But they also have loads of other random sweets and crisps. 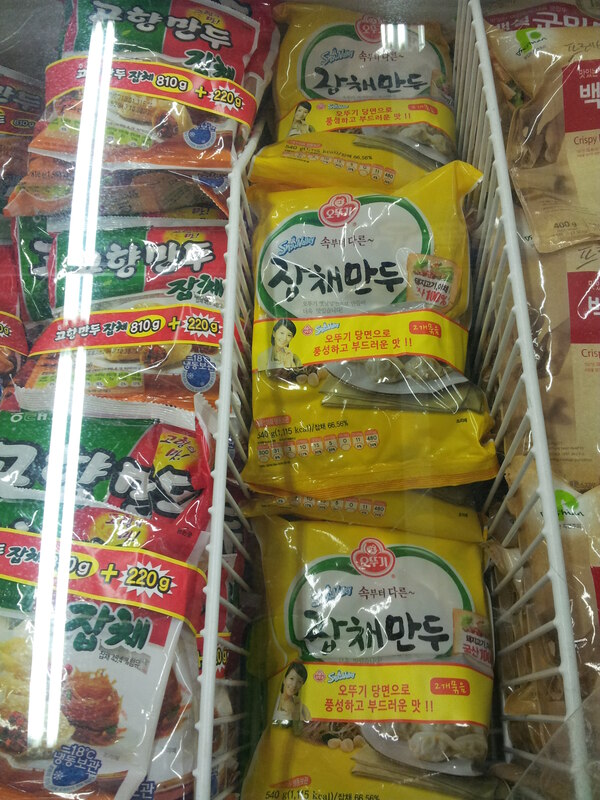 No Taytos and no salt and vinegar flavour but shrimp, pizza, original and all other kinds of random flavours. I can’t find the words…….. 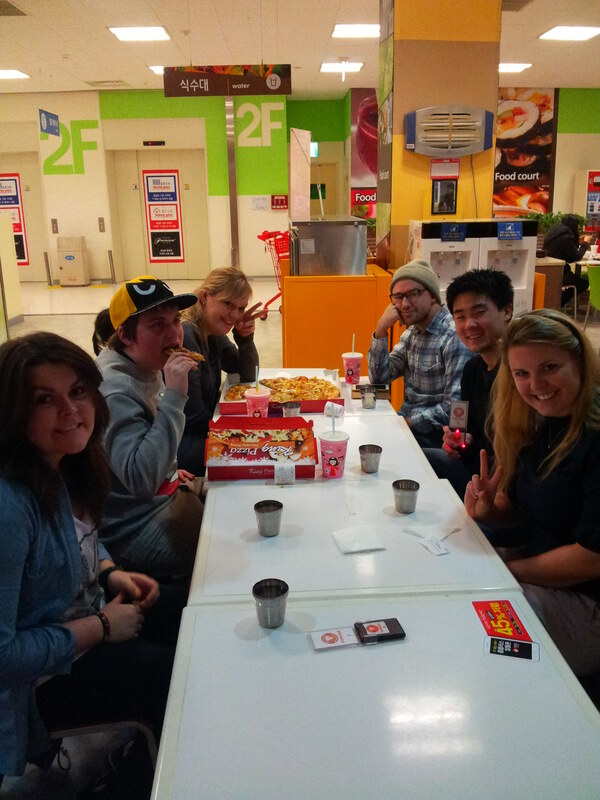 Huge thanks to Clare Gaffney for coming along on the supermarket adventure. As ever, leave your comments below.